Royal’s Time Pilot Vetro Electronic Time Clock frees you from the time-consuming and error-prone task of calculating employee hours each pay period. 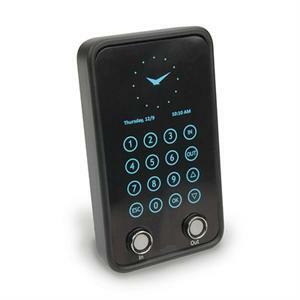 More reliable and durable than fingerprint technology, up to 500 employees can clock in and out using a nearly indestructible iButton. Employees can also clock in by entering their 4-digit employee number on the Vetro’s touch screen, if allowed. The Royal Time Pilot Vetro can be mounted anywhere and, if desired, be connected directly in your in-house network. No cables needed! Mount the Vetro anywhere and collect your data with the included USB drive or plug it into your network for real-time data!